Media attention is currently focused on the freedom of navigation operation by USS Lassen (DDG 82) near Chinese reclaimed features in the South China Sea. Quill or Capture is sticking with this topical nautical theme with a brief description of a naval review held farther north. On 18 October, the Japan Maritime Self-Defence Force (JMSDF) organised a fleet review off Tokyo’s coast, the 28th time the JMSDF has held such a naval parade. 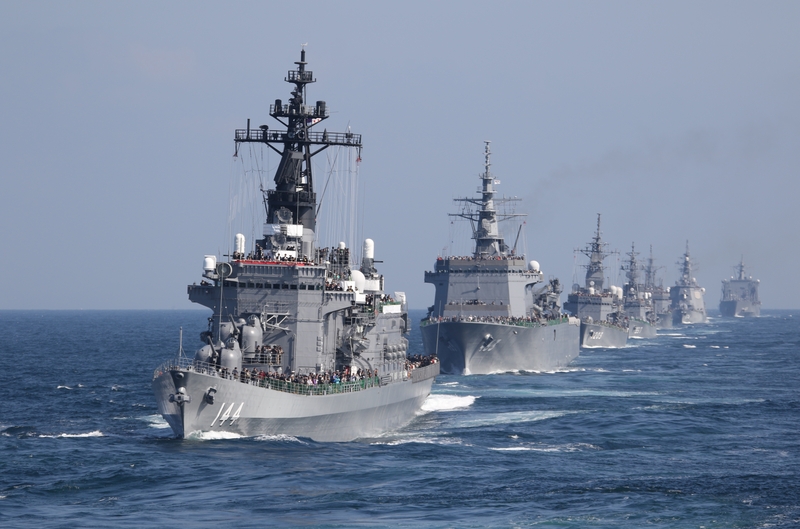 This year’s event featured 23 JMSDF warships as well as 26 aircraft representing all three services. Also adding to the occasion were international warships from Australia, France, India, USA and, interestingly given the tensions between the two countries, South Korea. A US Navy (USN) P-8A Poseidon aircraft and US Marine Corps MV-22B Osprey also performed flypasts. Although not officially part of the review, the Japanese armada sailed past the USN carrier USS Ronald Reagan, and Prime Minister Shinzo Abe was even helicoptered aboard. This was actually the first time for a sitting Japanese prime minister to board a US aircraft carrier. Aboard the destroyer JS Murasame (DD 101), foreign media enjoyed blue skies and blue seas (although one Japanese videographer managed to succumb to seasickness in the perfectly calm conditions) during the fleet review. There were a number of dynamic demonstrations, including submarines submerging and surfacing, missile patrol boats launching anti-missile infrared decoys, and P-3C Orion aircraft dropping anti-submarine depth charges. 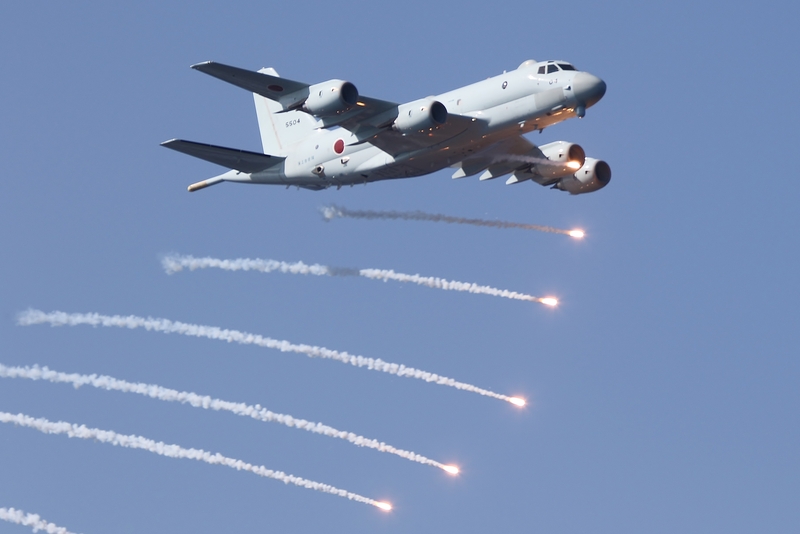 Another highlight for me was the appearance of Kawasaki P-1 maritime patrol aircraft of the JMSDF dropping flares, my first glimpse of this aircraft that is also being proffered to countries such as the UK. A final highlight was the presence in the review of the 19,500t JS Izumo. 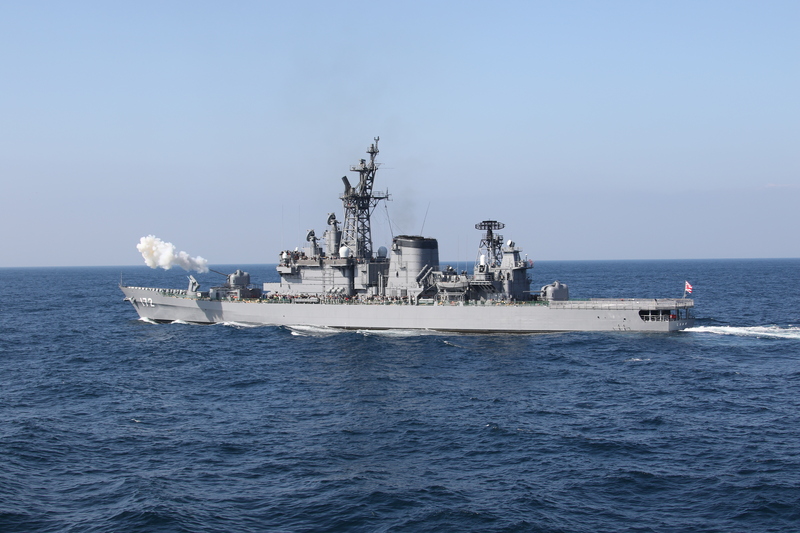 The latter, euphemistically termed a helicopter destroyer, was commissioned on 25 March as the JMSDF’s largest ever vessel. The 248m-long ship can accommodate up to 14 helicopters.